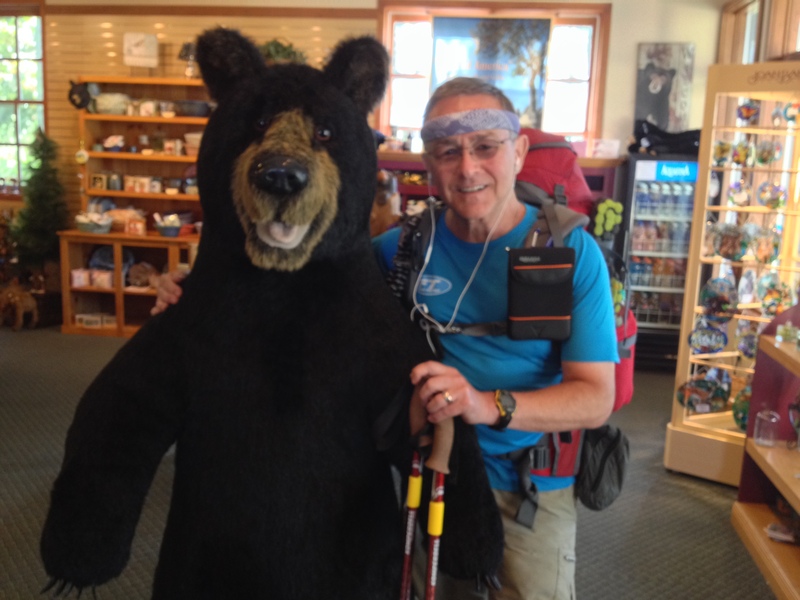 Bear busted for shopping in store at Shenandoah National Park’s Skyland Resort. He was a nice guy! Psst! Hey you… Yah, you. Wanna lose weight? You do. Guess what? Hike for 13 days and 160 miles straight through on the AT without a zero and eat only what’s in your pack and YOU too can lose a pound per day. I did. Betcha! One more hike like this and I might be willing to take my shirt off at the beach. My first training hike is in the books. Sept. 24th was day one. I launched at 10:08 a.m. from Rockfish Gap, Va. It was 55*F. At 10:12 I saw three bears before I could even get off the road and into the park! An auspicious beginning if ever there was. By the time they get this far, 858 miles into their hike, most thru hikers can knock out the distance from Waynesboro, Va. to Harpers Ferry in about 10 – 11 days. Since this was a test of my injured right foot, my gear, food, and much more, my pace was deliberately slower. The first day was seven miles to the Calf Mountain shelter. Most thru hikers would want to bang out more miles, but maybe not the 20 miles to the next shelter at Blackrock. For those wanting to do more than seven, but less than 20, I counted 14 excellent stealth camping sites scattered between Calf Mountain and Blackrock. The only caution is that water is available only at the shelters. Tank up at Calf Mountain and you’re good to go. I set the first day deliberately short followed by two 13s in a row. The schedule next called for rest following an eight mile NERO. I reached my destination just after noon and cooled my heels until some great guys showed up to spend the evening. Following that, the days averaged around 12 until I got word that the remnants of a tropical storm would clobber the trail on Monday Oct. 7. Not wanting to ride out a tornado watch and a deluge in some shelter, I hiked three 15s and a 20 in order to finish a day earlier than planned. Two weeks without rain – priceless! Pushing that hard – ouch!! My initial pack weight was very heavy on purpose. For example, I carried all the food and supplies needed for a full fortnight. I also lugged my full winter kit since that’s the heaviest weight scenario. Other small things added up such as packing a full bottle of Dr. Bronner’s liquid soap. As time passed, the weather changed. In the beginning morning temps hung in there around 40 with day time highs around 60 – 65. This near perfect hiking weather shifted to sticky windless summer temps in the second week with the final day ending above 90. My sleeping bag smelled worse than my socks – and my socks smelled so bad they actually woke me up one night! They got kicked out of the tent after that. In spite of the weather, I managed to stay relatively clean. I did laundry and shower at Lewis Mountain camp ground and again at Bears Den. I washed my shirts out in streams a couple of times. Twice I was alone at night and use the solitude as car wash moments. Lessons learned? You can bet I’ll never do that again. When I finished I was still strong, but sore and beginning to notice some of the classic overuse injury symptoms. For me, a zero is in order at least once per week. My initial pack weighed 37 lbs. That’s at least 10 lbs. too heavy. I’m glad I could manage it, but even as I ate the weight down, the dead weight on my back sapped my morale much more than I would have predicted. Most of the extra weight was food. I had way too much in the beginning, so I gave some away. Regardless, I still finished with two extra meals. I can also cut weight elsewhere. My fist aid kit could treat a decimated army. It can be much smaller. A little Dr. Bronner’s goes a long way. I’ll repackage it and other liquids and consumable supplies into week size portions. Beyond that, I’m chopping up David “Awol” Miller’s guide book into bite size chunks. That thing is a brick. Speaking of Awol’s AT Guide, it’s excellent, but as many in the class of 13 noted, the trail profile is hard to decipher. When you think it’s going to be hard, it isn’t and visa versa. Fortunately I had topo maps which don’t lie and never run out of batteries. What’s going on with Awol’s guide may have more to do with the trail surface than anything else. The rocks make a difference. If the rocks are difficult, the trail is hard in spite of its ascending or descending grade. Stay tuned for my rock classification post. If you’ve never heard of a Susquehanna snot slicker, you will. This is a family blog, so scatological discussions are not normally part of the genre. However I did have one eureka moment. You’re gonna use a lot more TP than you think. When I needed to resupply, the store was out. Table napkins are a most excellent replacement. Never goin’ back if you know what I mean. The special orthotics my podiatrist made saved me from the pure brutality the rocks inflict on your feet. Excellent investment they were. Last note. Bears Den is a jewel of a hostel. Dana and her husband are warm and welcoming hosts. I wasn’t the only one who could not eat the entire hiker special – pizza, pint of Ben & Jerry’s and a soft drink. Also, the guide doesn’t mention that you get to cook your own free pancakes for breakfast. My trail crew will be at Bears Den Nov. 2 to help with some projects. Can’t wait. As soon as I get new boots, get my orthotics adjusted, a sleeping bag liner and a couple of other things. I’ll be on my way from Harpers Ferry to Duncannon, Pa.